Our tagline 'discerning humanity' refers to the 'discernment of spirits', which is one of the key elements in the Jesuit way of looking at the world. 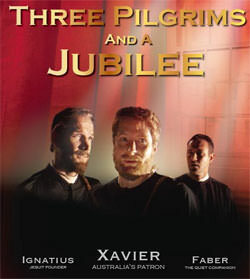 The best known early Jesuits included Ignatius Loyola, Francis Xavier and Peter Faber. They perfected a way of recognising underlying good and evil as an aid towards working through the ethical dilemmas of the day. Their day was 500 years ago (we are celebrating their Jubilee in 2006). In the 20th century, Mother Teresa devoted her energies to providing urgent care for those who appear poor. The Jesuits also use tools of social analysis to work out who is actually poor and why, with a view to promoting long-term social change. For all is not as it seems. This month, the English-speaking Jesuit world's best known social analysis practitioner - Fr Peter Henriot - is visiting Australia. 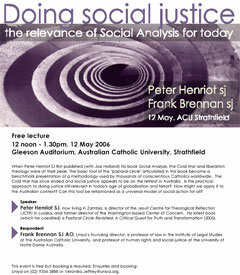 He is conducting public seminars alongside Fr Frank Brennan, one of our writers in this relaunched Eureka Street. His article is based on the Ninian Stephen lecture he delivered last week at the University of Newcastle. Brennan uses his legal expertise, and Jesuit intuition for social analysis, to suggest that native title is not all it seems. He concludes that the chief beneficieries are lawyers, not indigenous Australians, and it's time for a new system of recognising native title. Social analysis, and the discernment that goes with it, require a particular disposition of the mind and heart. The Jesuits cultivated - and continue to cultivate - this state, through rigorous spiritual practice that includes the 30 day silent retreat. As Eureka Street embraces the rapid-fire online medium after being a print publication for 15 years, it might seem that we are turning our back on the state of thoughtfulness with which we believe our articles must be read. One of our continuing editors - Andrew Hamilton - says Eureka Street is about 'slow reading' - an activity akin to 'slow cooking'. It appeals to the discerning palate. Our challenge will be to find a space for this vibrant, still point, as we shift into the fast-moving online world. Good luck with the new medium - the site looks fantastic! The arrival of West Papuan refugees raises complex questions. Discussion must begin by honouring the humanity of the West Papuans involved. Refugee lawyer David Manne sets new refugee legislation in its historical context, and exposes its radical and brutal character.